1 Department of Environmental Engineering, Zhejiang University, Huajiachi Campus, 268 Kaixuan Road, Hangzhou, Zhejiang 310029, China. 2 MOE Key Lab of Environmental Remediation and Ecosystem Health, College of Environmental & Resources Science, Zhejiang University, Hangzhou 310029, China. 3 Huzhou Vacational and Technical College, Huzhou Zhejiang 313000, China. The stimulatory effect of low concentrations of toxic chemicals on organismal metabolism, referred to as hormesis, has been found to be common in the widely used luminescence bioassay. This paper aims to study the hormesis phenomenon in both marine and freshwater luminescent bacteria, named Photobacterium phosphorem and Vibrio qinghaiensis. 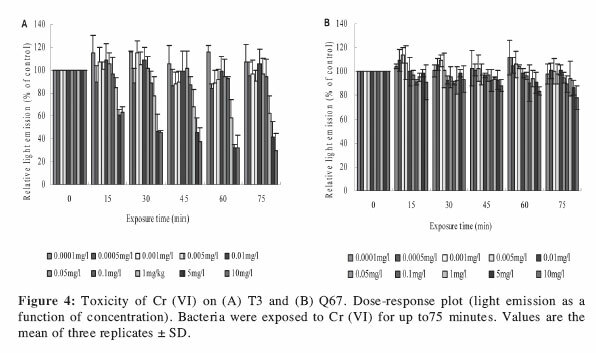 The effects of Cu (II), Zn (II), Cd (II) and Cr (VI) on luminescence of these two bacteria were studied for 0 to 75 minutes exposure by establishing dose- and time-response curves. A clear hormesis phenomenon was observed in all four testing metals at low concentrations under the condition of luminescence assays. Key terms: Hormesis, bioluminescence, Q67, T3. the necessary salinity (2-3 % NaCl), have limited its actual use in environmental sample testing (Hinwood et al., 1987). Vibrio qinghaiensis is a species of freshwater luminescent bacterium, isolated from an edible fish (Zhu et al., 1994). This bacterium exhibits a wide pH tolerance and can be luminous in freshwater. It is a useful and promising tool in toxicity testing (Ma et al., 1999). The stimulatory effect of low concentrations of toxic chemicals on organismal metabolism, referred to as hormesis, is common in luminescent bioassay (Fulladosa et al., 2005b; Fulladosa et al., 2007b). The aim of this study was to examine whether the hormesis response is ubiquitous in the testing of metals using freshwater bacterium Vibrio qinghaiensis (strain Q67) bioluminescence assay. Hormesis response was also examined with the marine bacterium, Photobacterium phosphor em (strain T3), which is the strain recommended for luminescent bioassay by the Chinese Environmental Protection Agency (China-NEPA, 1995). The freshwater luminescent bacterium Q67 was kindly provided by Professor Zijian Wang and Dr. Mei Ma from Research Center for Eco-Environmental Sciences, Chinese Academy of Science. Lyophilized T3 bacterium was obtained commercially from Nanjing Institute of Soil Science, Chinese Academy of Science. The tested heavy metals, Cr as K2Cr207, Zn as ZnS04, Cu as CuS04 and Cd as CdCl2, were analytic grade. In order to avoid metal precipitation, stock solutions of each salt, obtained by dissolving the corresponding amount of salt in test medium, were adjusted to pH 5.4 (Cr, Zn, Cd) and 4.5 (Cu) respectively using 0.1 N NaOH or HC1 according to the testing protocol of luminometer. The culture and assay methods are similar to those of Ma (Ma et al., 1999). Briefly, each bacterium was inoculated from a stock culture, which is maintained on culture medium agar at 4°C, to a fresh agar and cultured at 22 ± 1°C for 24 h. The cells were further grown in liquid culture medium by shaking (120 r/min) at 22 ± 1°C for 18 h and harvested by centrifuge at 3000 rpm for 10 min. The pellet was resuspended with test medium and centrifuge twice. Bacterial suspension was kept at 22 ± 1°C for 30 min before the test. The assay was conducted in triplicates. Before each test, the light unit of suspension was adjusting to 300-900 by adding test mediums. The assays of both Q67 and T3 were carried out by adding 0.1 ml bacterial suspension and 0.9 ml test medium to a glass tube. It was thoroughly mixed and the initial light unit was recorded by Model Toxicity Analyzer DXY-2 (made by Nanjing Institute of Soil Science, Chinese Academy of Science) every 15 min incubation at 22 ± 1°C. The results are shown in Fig. 1-4. The figures describe an enhancement of light output above the controls for all the metals used in liquid culture bioassays at certain concentrations. Effects on luminescence, as studied by establishing dose- and time-response curves, confirmed that low doses of these poisonous metal ions were not particularly toxic to either Q67 or T3. In contrast, it was possible to observe a clear hormesis phenomenon in each exposure. 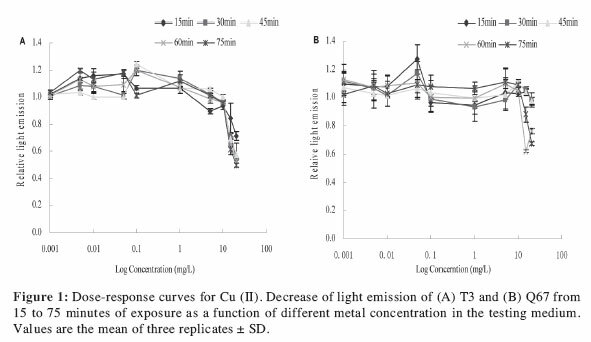 Fig.l shows the effect of different concentrations of Cu (II) in testing media on Q67 and T3 luminescence. In general, an undulant response was evident with limited enhancement in light output. 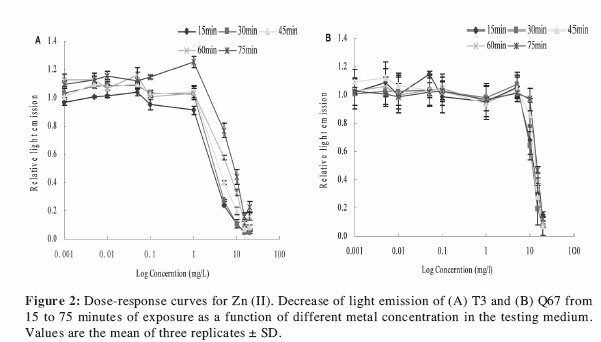 As to Zn (II), the increase of luminescence was also found in the low concentration (especially those below to 1 mg/L) within two bacteria (Fig. 2). For Cd (II) exposure, both bacteria exhibited hormesis phenomenon (Fig. 3). However, their performances were different. With concentrations as high as 5 mg/L, inhibition on Q67 was already obvious, while even 10 mg/L Cd (II) could cause T3 luminescence stimulation. This phenomenon indicated that T3 has stronger Cd (II) tolerance than Q67. The condition to Cr (VI) exposure is different from those of Cd (II) (Fig. 4). Although hormesis was observed as well, T3 exhibited higher sensitivity than Q67. Low levels of copper did not greatly decrease bacteria luminescence, instead, those low concentrations were observed to increase luminescence intensity compared to the control. This phenomenon could be related to hormesis, which is defined as a stimulatory beneficial effect of very low concentrations of toxic chemicals on organisms (Calabrese, 1999a). Comparison between the two bacteria showed that Q67 was more sensitive than T3 to Cu (II) exposure. Luminescence stimulated by Zn (II) exposure has also been described by Christofi et al. (2002), who found an enhancement of luminescence induced by low concentrations of zinc. The toxicity of copper and zinc on bacteria might be explained by their bactericidal and antimicrobial nature, which might strongly affect bacterial enzymatic systems, as suggested by the reports related to V. fischeri (Fulladosa et al., 2005a). 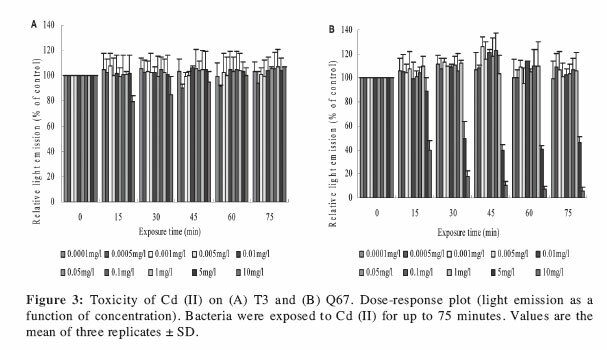 Neither bacterium showed serious toxicity from Cd (II) and Cr (VI). It was reported that some Gram-negative bacteria, including the widely used Microtox luminescent bacterium V. fischeri, are not sensitive to cadmium exposure (Fulladosa et al., 2005a). The low toxicity of cadmium might result from the presence of exopolysaccharides on the outer layer of the bacteria membrane, which has been found to adsorb and trap cadmium. Since both Q67 and T3 are Gram-negative bacteria, they may have the same cadmium tolerance mechanism. Gellert (2000) concluded the concerned factors causing toxicity differences in related elements. The cell wall composition which concerning the element uptake by bacteria was involved. Interactions between toxic elements and enzymes or allosteric effectors at critical steps of metabolic pathways related to supply cell energy might be one possible mechanism. Moreover, interactions of the toxic elements with the luciferase complex, which affects luminescence, might be another reason for the different toxicity levels. Fulladosa et al. (2005b) concluded that the mechanisms responsible for the low toxicity of Cr (VI) to bacteria may include the blockading of chromate transport, chromate-active efflux and the activation of the Cr (VI) decreasing mechanisms. The tolerance of bacteria to Cr (VI) has long been reported. A range of Cr (Vl)-resistant bacteria have been proven able to reduce chromate into Cr (III). V.fischeri was also found to be able to decrease chromate actively. Our results about the poor toxicity of chromate in Q67 might be partly attributed to this mechanism. Hormesis is a widespread phenomenon in the exposure to metals with luminescent bacteria. But hormesis is rarely mentioned and accepted in mainstream toxicology. One reason that hormesis is not often reported in bioassays, as well as luminescent bacteria, is probably the subacute concentrations used (Calabrese et al., 1999b). Furthermore, the hormesis response is always very minor and is often considered as an experimental error or distortion of results. The data showing the elevated response (increase in bioluminescence in a test culture) is ignored in toxicity calculations. Additionally, experimental design has an effect on the observation of hormesis (Teeguarden et al., 1998), as when the concentrations of toxin being tested are too broadly spread, thus missing the response. This work was supported by the Program for Changjiang Scholars and Innovative Research University Teams (IRT0536).